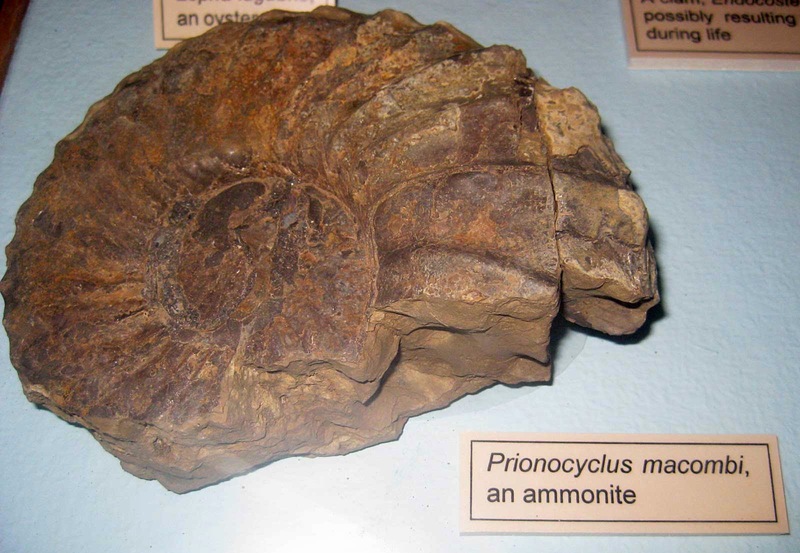 This Prionocyclus macombi (Meek, 1876) ammonite fossil is on display at the Mesa Verde National Park as of August 2014. The ammonite existed in the Late Cretaceous Period (Campanian). The area is rich in geological history going back 2 billion years. The national park was founded in 1906 to protect the Anasazi Native American sites found on the mesa tops, cliffs, and canyons. The exposed areas found in the park are from the Mesozoic Era, Cretaceous Period (about 100-78 million years ago). They make up four formations: Cliff House, Menefee, Point Lookout, and Mancos. Available at amazon.com at this web link.